The deluge of protests, marches, public witnesses, and other forms of activism in response to the past year’s onslaught of destructive policies tested the endurance of even the most seasoned advocates. But people of faith were ever-present in the constant calls for a more just nation, standing at airports to protest the Muslim ban; challenging racism, anti-Semitism, and homophobia in Charlottesville; standing outside the Supreme Court to fight for equal protection under law; holding vigil outside the Capitol to save Medicaid; and more. At the core of this activism is a deeply held belief that faith values can provide collective wisdom for the creation of policies that are life-giving, respectful, and that provide for the common good. With another contentious year of regressive policies on the horizon from the White House, Capitol Hill, and state legislatures, people of faith have never had a more critical role to play. Articulating a moral vision for the nation; affirming the public good and civic engagement; holding elected officials accountable; and helping create a consensus on how the United States can be fair and equitable for everyone, are all important elements of the multifaceted movement for justice driven by and rooted in faith. This movement addresses issues such as religious liberty; criminal justice reform; social and economic equality; voting; and everything in between. Many faith leaders are on the front lines working to build a better world. Here are 10 leaders and groups to watch in 2018. Rabbi Andrea L. Weiss is an associate professor of Bible at the Hebrew Union College–Jewish Institute of Religion in New York. According to Weiss, “Words and actions during and after the  election seemed to call into question fundamental values that have long defined our nation.” Those observations inspired her to launch American Values Religious Voices: 100 Days. 100 Letters., a campaign highlighting the voices of 100 scholars of religion from across the country and representing the full spectrum of diverse religious traditions, including Christian, Jewish, Muslim, Buddhist, Hindu, and Sikh. With the rising incidence of hate crimes in the wake of the election, Weiss’ goal was to provide “guidance, inspiration, and a reaffirmation of what it means to be an American” from the perspective of religion scholars. The campaign sent one letter per day for the first 100 days of the new presidential term; recipients included President Donald Trump, Vice President Mike Pence, and members of the 115th Congress. The letters explored core American values that have guided this country for centuries, tracing their roots to various faith traditions and sacred texts. The letters covered topics ranging from compassion, hope, and courage, to equality, truth, and unity. These authors’ keen insights serve as a reminder of the fundamental values that should remain at the center of the national discourse to ensure that policies uplift rather than oppress. A year later, the campaign highlights the wisdom of the letters on Twitter and Facebook through the Values and Voices Presidential Primer. Understanding the major health care issues affecting communities of color—gun violence, cancer, diabetes, asthma, and obesity—DeShazier was one of the most vocal advocates in activists’ five-year battle to open an adult trauma center on the South Side of Chicago. The South Side community had been without adult trauma care since 1991, forcing residents who experience a disproportionate amount of gun violence to travel as far as 10 miles to be treated—losing lifesaving time. Ultimately, the community prevailed in its efforts to secure the trauma center. DeShazier now serves as chair of the University of Chicago Medicine Community Advisory Council, which focuses on optimizing population health outcomes on the South Side of Chicago. DeShazier’s prophetic voice and advocacy work is particularly important in light of the continuing national debate about the United States’ need for access to affordable health care. He is a regular contributor to Sojourners, ON Scripture, and HuffPost publications, through which he frequently challenges the faith community to align their lives with their words, actions, and beliefs. Dr. Robyn Henderson-Espinoza is a leading activist and scholar, publishing work on philosophical theology and ethics while helping faith communities around the country use theological scholarship in their activist justice movements. As a nonbinary, transgender Latinx, Henderson-Espinoza brings a variety of important perspectives to their work, particularly in foregrounding racial and LGBT justice in intersectional movements. As a public theologian in residence at Faith Matters Network, an organization working to highlight the voices of people of faith who have not historically been recognized, Henderson-Espinoza’s goal is to bring together their theological studies of social ethics, race theory, and queer theory in a way that is politically useful for all faith communities. Their work building bridges between faith communities, justice movements, and academia is the subject of their forthcoming book, Activist Theology: Recognizing the Prophetic Edge in the Streets. 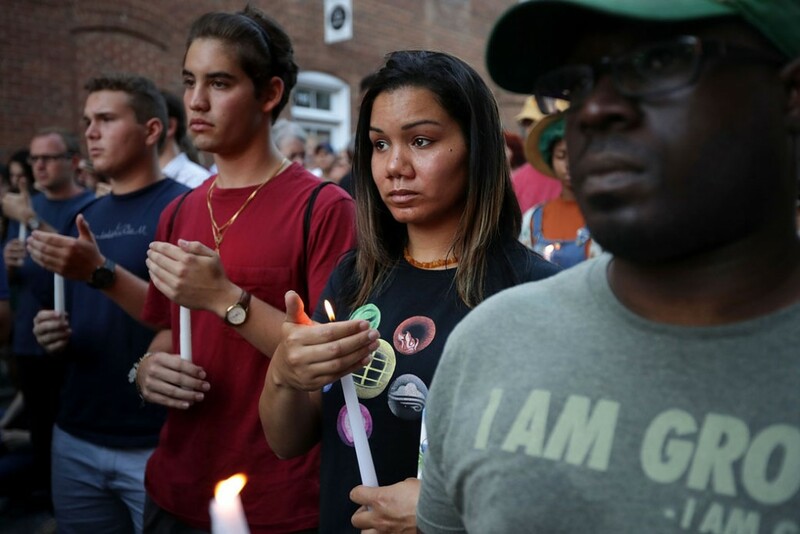 Henderson-Espinoza garnered attention in 2016 with their pastoral response to the Charlottesville protests, calling for a diverse and multigenerational movement to combat white supremacy. They provided crucial counseling to many victims of violence at the protest who found themselves shocked and lost in the face of the hate. As injustice and violence toward certain communities become normalized, Henderson-Espinoza’s unique perspective and healing work comes at an especially important time. Simran Jeet Singh is a scholar of religion and an expert in South Asian religious history. An increasingly important voice in a political moment charged with racist and xenophobia rhetoric, Singh studies how race and religion interact in the forms of Islamophobia, xenophobia, and hate crimes seen in the United States following the 9/11 attacks. He is also a visible presence on social media and in popular media, promoting diversity and religious tolerance with humor and sensitivity. Singh has been part of many efforts to increase interfaith dialogue, including representing Sikhs on Gov. Andrew Cuomo’s (D-NY) Interfaith Advisory Council, and has spoken at the White House and the Pentagon to commemorate Sikhs’ contributions to important American institutions. Singh is also a fellow for the Sikh Coalition, an organization aiming to promote civil rights, empower Sikh communities, and fight bias and discrimination against all faith traditions. To that end, he published a book instructing journalists on how to justly and accurately report on Sikh individuals and communities. Singh has established himself as a strong voice of reconciliation and healing following hate crimes and attacks on the Sikh community. Increased visibility of the Sikh community is an important milestone, as cities such as Hoboken, New Jersey, elect Sikhs into public office. However, this visibility will also highlight how little people know about communities of color, and educators such as Singh will play a crucial role in the resistance against intolerance. Bishop Mark Seitz of El Paso, Texas, has become a leading voice of faith in the long fight to protect undocumented immigrants from unjust and heartless deportation. Seitz became the first bishop in 10 years to issue a pastoral letter regarding the current state of immigration, stressing that “nations that enjoy the peace, prosperity and security that we do must ensure that there are sufficient legal avenues for migrants workers and their families, who fill important roles in our economy, to migrate in a safe and orderly way.” Seitz has gone beyond powerful rhetoric as well, representing undocumented immigrants in court, establishing a scholarship fund to help migrant children attend Catholic schools, and prohibiting U.S. Immigration and Customs Enforcement agents from entering El Paso’s diocesan schools and churches without a warrant. Seitz has been a particularly strong supporter of the Deferred Action for Childhood Arrivals (DACA) program, which deprioritized the deportation of thousands of undocumented immigrants brought to the United States as young children. In advance of the Trump administration ending the program, he joined a moral mandate to Chief of Staff John Kelly defending DACA, which emphasized that “[b]reaking up families and communities undermines the best values of our nation.” Seitz’s moral leadership and unequivocal advocacy on behalf of undocumented immigrants and Dreamers will be increasingly critical to illuminating the human core of this issue as immigration deals develop in Congress and the White House. Rev. Jeania Ree Moore is the director for civil and human rights with the General Board of Church and Society, The United Methodist Church’s (UMC) social justice agency in Washington, D.C. There, she leads a portfolio of hot-button issues, including immigration, gun violence prevention, and criminal justice reform. Despite having begun her position three months before the politically charged 2016 U.S. presidential election, Moore was well-prepared by previous experience at Emory University’s Candler School of Theology. While a seminary student there, she helped lead a campaign to stop the execution of a woman on death row. Her passion grew out of work in chaplaincy and teaching theology at Lee Arrendale State Prison through Emory’s prison ministry and education programs. A UMC deacon who is ensconced in the world of faith-based advocacy and organizing, Moore is a theologian by training with a background in systematic theology and theological aesthetics. She brings her interests to bear on her current work by joining art and social justice. In her time at Church and Society, the office has begun hosting public art installations on criminal justice reform, the death penalty, immigration, and gun violence, using its building’s prominent location on the only nongovernmental plot on Capitol Hill—adjacent to the U.S. Supreme Court and across from the Capitol—to uplift artistic calls for justice to millions of visitors annually. These displays marry faith, art, justice, and action while highlighting grave injustices in U.S. policy. This arresting, participatory, visceral action in art and justice, of people of faith speaking prophetically in the public square, engages with the current political moment to prick the nation’s consciousness about inequality and immoral and unjust policies. Ronald C. Smith is an elder in the African Methodist Episcopal (AME) Church and the pastor of Wayman Chapel AME Church in Union Springs, Alabama. He is also a retired forester with the U.S. Department of Agriculture Forest Service and currently serves as an instructor of forestry and Natural Resources in the College of Agriculture, Environmental and Nutrition Sciences at Tuskegee University. Smith and his family are pioneers in the resistance to the Alabama Department of Environmental Management’s (ADEM) siting of the Tallassee Waste Disposal Center Landfill in the Ashurst Bar community. Smith along with his wife and children, live near Stone’s Throw Landfill, a massive, ADEM-permitted landfill. The landfill has been expanded several times, taking land from black homeowners whose families have lived in Tallassee for generations. It has become one of the largest landfills in Alabama, accepting everything from household garbage to blocks of asbestos and even septic sewage. Speaking candidly about environmental injustice in his community, Smith explains, “Our community is small. We are suffering. We are losing land. We are losing our children’s future… [they] move out and go somewhere else. And I wouldn’t want my children to come back and have to live around a landfill.” Represented by Earthjustice, Smith and several other residents have filed a lawsuit against the Environmental Protection Agency (EPA) for its backlog; the community has had pending EPA complaints dating as far back as 1994. Under President Trump, the EPA has rolled back environmental regulations and has been working around the clock to eliminate key federal rules, including limits on landfill emissions, which would directly affect the health and safety of the Ashurst Bar community and many other areas like it. Motivated by his faith, Smith continues to fight for a clean and healthy environment for his community now and for generations to come. 2017 saw many high–profile fights over whether individuals and businesses could claim religious liberty to protect themselves from the consequences of discriminating against women and LGBT individuals. The most sweeping religious exemptions bill was Mississippi’s H.B. 1523, which passed in 2016 and went into effect last year after a monthslong legal challenge. The plaintiffs were an inspiring group of faith leaders and congregations, diverse in faith tradition, race, sexual orientation, and their location in the state. They united in hopes of preventing Mississippi from permitting discrimination in the name of religious freedom. Rabbi Jeremy Simons, who gave a heartfelt testimony during an H.B. 1523 hearing, has said, “People are godly and deserving of respect. There are no asterisks, there are no caveats there.” Although the injunction was lifted when the 5th Circuit Court of Appeals decided this group of faith leaders did not have standing to sue—the group, represented by the Mississippi Center for Justice, may seek additional review—their witness offers some hope for LGBT people, single mothers, and cohabitating unmarried couples throughout Mississippi who may face legally sanctioned discrimination. These leaders also offer inspiration heading into another year of anticipated controversies around religious freedom and state and federal nondiscrimination laws. Allyson McKinney Timm is an elder in the Presbyterian Church (U.S.A). She is a theologically trained human rights attorney whose commitment to justice ministry inspired her to establish Justice Revival, a nonprofit organization that works to motivate, educate, and mobilize Christian communities to respond faithfully to the biblical call to justice by standing in solidarity with the oppressed and defending the human rights of all. Justice Revival offers training programs that explore the biblical imperative to pursue justice in the context of the modern human rights movement. McKinney Timm’s current work has been shaped by more than a decade of experience addressing domestic and international human rights violations. As she defended the rights of vulnerable widows and orphans in Uganda; worked with the United Nations to prosecute atrocities in Rwanda; and served as a Robert M. Cover-Allard K. Lowenstein Fellow in Human Rights at Yale Law School, addressing issues of forced marriage, human trafficking, religious liberty, as well as rights to education and housing, she became convinced that people of faith should have a more visible role in promoting human rights. Reflecting on her journey, McKinney Timm explained that her concern about the need for increased religious resistance to human rights violations in the United States prompted her to pursue a Master of Divinity at Yale Divinity School and to launch Justice Revival. Her writings explore the faith imperatives of confronting injustice; they appear in Sojourners, California Lawyer, and USA Today. She said she believes that Christians should not regard their faith as a siloed system of belief but should instead embrace a mandate for courageous action to pursue justice and stand with the oppressed. At a time when the world has finally begun to reckon with race and gender-based violence, Justice Revival’s theological human rights training could not be more timely and important. Reform Ohio, a project of the Religious Action Center of Reform Judaism, is organizing for criminal justice reform in Ohio. Reform Ohio is a grassroots effort to unite and empower Reform Jewish clergy and congregants in the pursuit of justice. As a Jewish values coalition, their first issue area focus is ending mass incarceration and reforming the criminal justice system—a critical goal in a state with the fourth largest prison population in the nation. Having successfully advocated with partners for the Targeted Community Alternatives to Prison program, which diverts low-level felons away from incarceration and instead places them with community programs, Reform Ohio is now organizing in support of a 2018 ballot initiative to prioritize treatment over incarceration in certain cases—the Neighborhood Safety, Drug Treatment, and Rehabilitation Amendment. While there have been hopeful reports of criminal justice reform in Congress, progress has been slow at the federal level. Reform Ohio is one of many advocacy organizations working to bypass congressional gridlock by starting in states and is a great example of the power of faith-based organizing directed at an issue that resonates locally and calls on a faith tradition’s core values. 2017 tested how intersectional and determined social justice movements could be, and 2018 promises more of the same. For faith leaders and faith-based advocates, 2018 will be a test of whether and how values-rooted efforts can cut through sometimes vicious political rhetoric and a cacophonic news cycle. The leaders featured in this column are emblematic of the best of faith communities: a hopeful belief that justice can and will be done by people working with and for one another, and the perseverance to fight despite seemingly endless challenges. The justice that these inspirational leaders are working for will reshape this nation, and the Center for American Progress’ Faith and Progressive Policy Initiative will be following with eager anticipation the change they bring in 2018. Gwen Calais-Haase is a special assistant for both Democracy and Government Reform and the Faith and Progressive Policy Initiative at the Center for American Progress. LaShawn Warren is the vice president for the Faith and Progressive Policy Initiative at the Center.